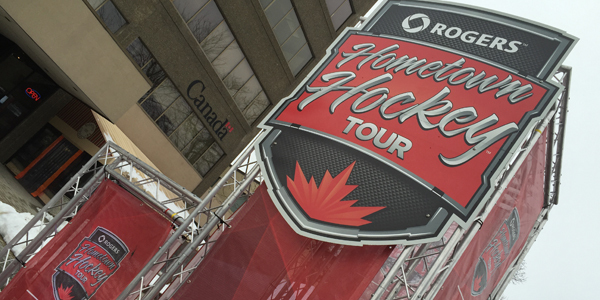 A weekend of @HometownHockey_ and a Samsung Galaxy Tab S Giveaway! 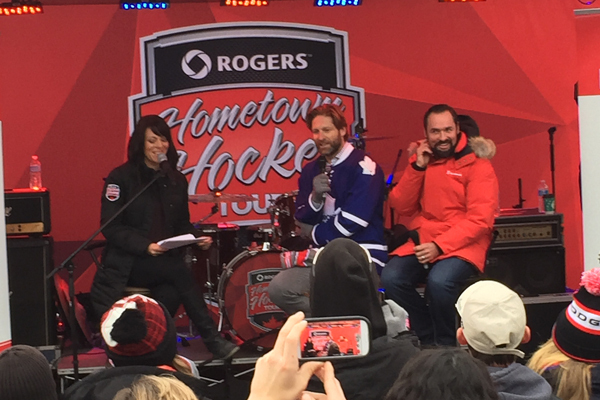 This past weekend, I attended the Rogers Hometown Hockey stop in St. Catharines, Ontario. I was picked up from my home by Gem Limo in a Lincoln Town Car. Talk about a comfy way to travel! 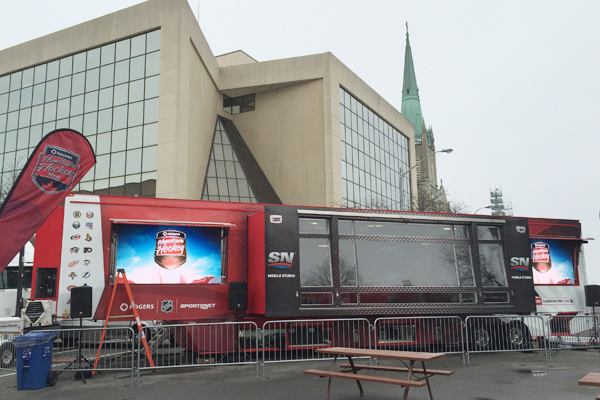 After arriving in St. Catharines, I checked into my hotel, and headed straight down to downtown St. Catharines, where the Hometown Hockey event was taking place. I was a bit early, so I got to see them setting up and some of the bands doing sound check. Sportsnet had an activation where you could be a broadcaster, and call game highlights with Evanka Osmak! 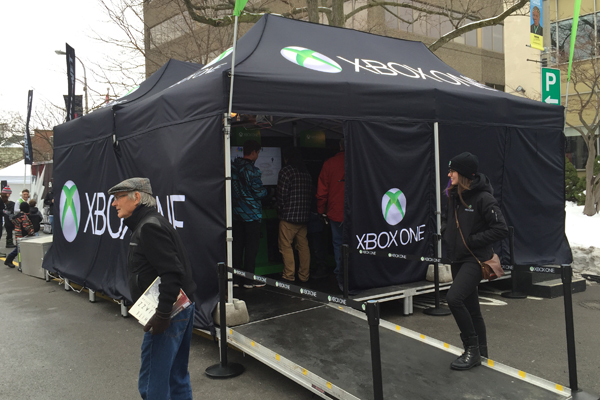 X-Box was there with several X-Box One units set up in a trailer, where you could play NHL15. If you were lucky, you could get a spot on a leather couch under a heater! Samsung was there showing their latest devices. 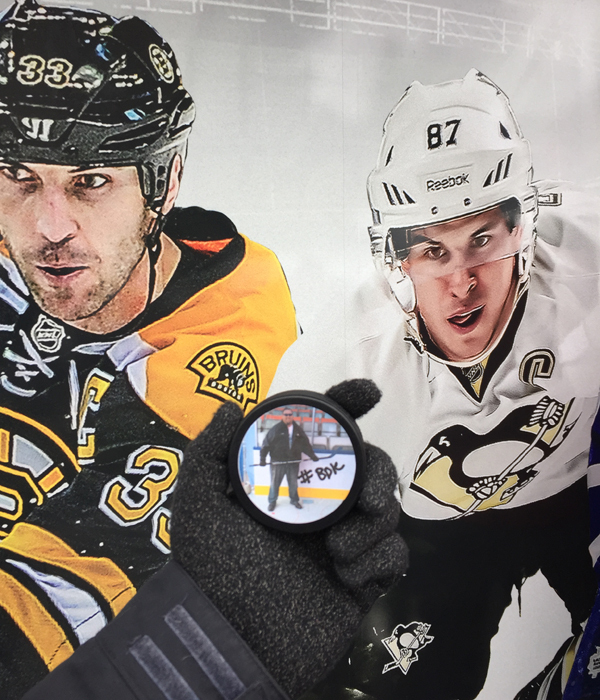 As well, you could get a custom personalized hockey puck! What a cool activation! 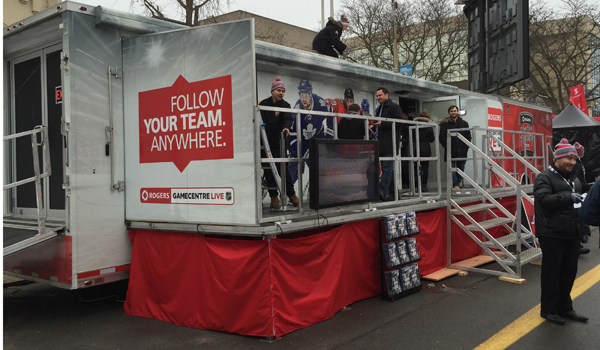 Rogers brought the action right to us with the Game Centre Live Mobile Centre. 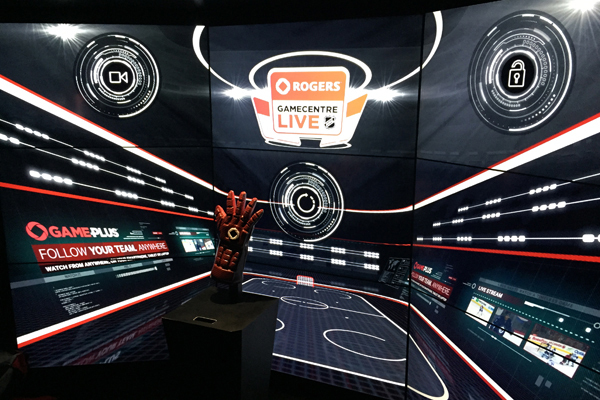 Inside, they gave a full interactive demonstration of the features of Game Centre Live. To say it was a cool experience is an understatement! At the end, they gave everyone a special pair of gloves, that not only keep your hands warm, but you could also wear them and use your smartphone at the same time! 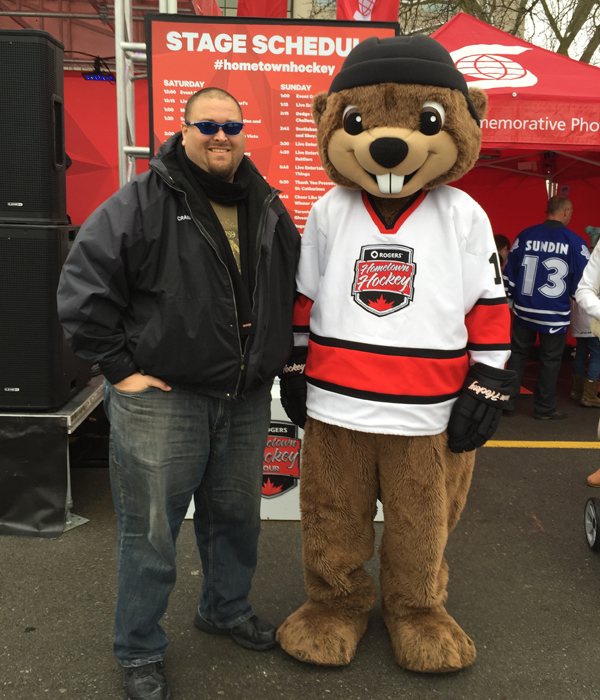 The Hometown Hockey Mascot was walking around taking pictures with all the kids… even the big ones! 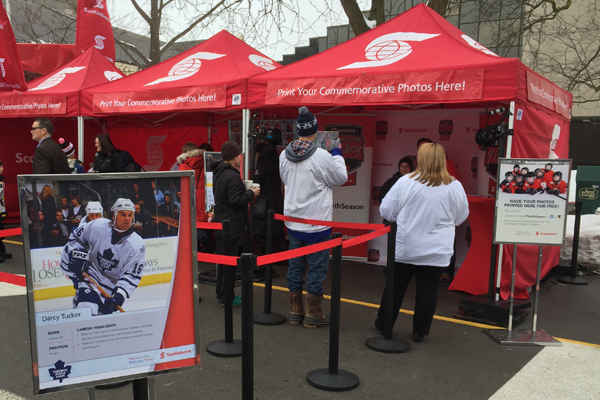 Get your picture with Darcy Tucker! This was one of the highlights of the day! I got to meet and get my picture taken with Darcy Tucker! He happens to be Wendy’s favourite hockey player. The lineup was always pretty long, but it moved quite quickly. Darcy was awesome, and he chatted with everyone. Such a personable guy! Mobile Studios, Community Lockers, and Beavertails! 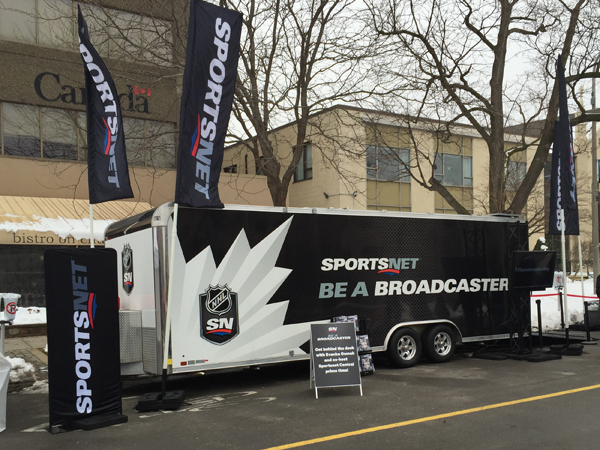 Rogers Sportsnet brought their mobile studio to broadcast live from Hometown Hockey. 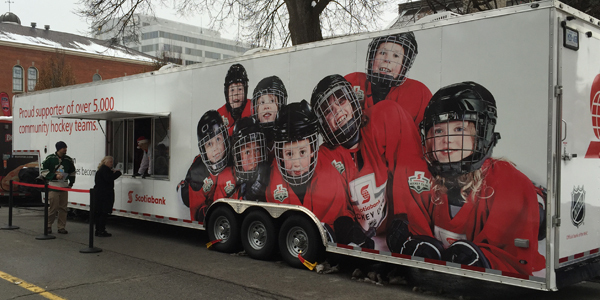 This studio travels with them for the entire Hometown Hockey tour across Canada. 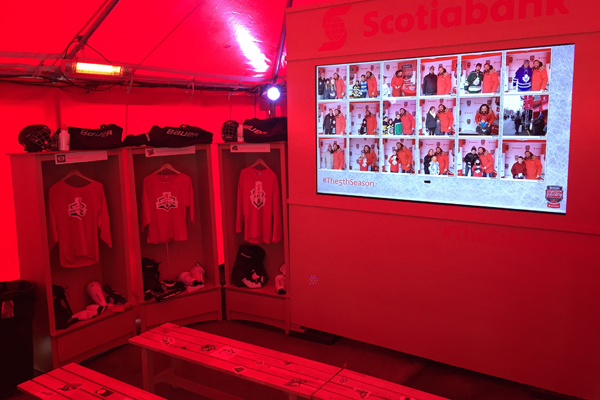 ScotiaBank set up a really cool Community Locker, where you could watch the game, play table hockey, or just take a rest on the benches set up. They were also popping fresh popcorn for you to enjoy. 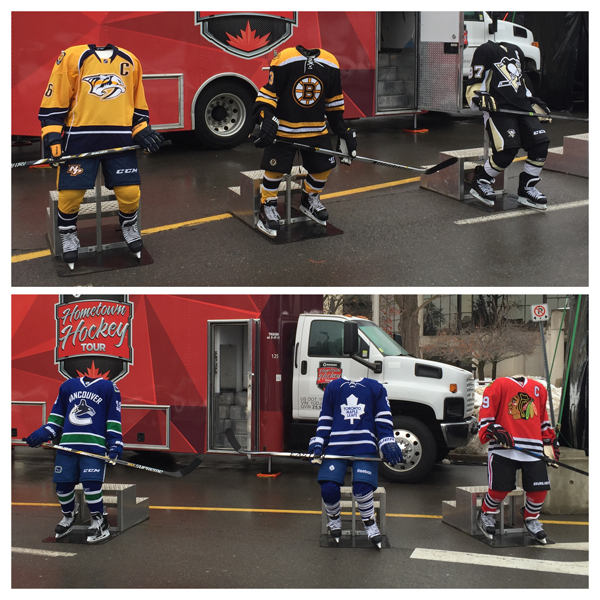 They were also handing out Hometown Hockey jerseys to kids 16 and under. I managed to get a couple for my girls. 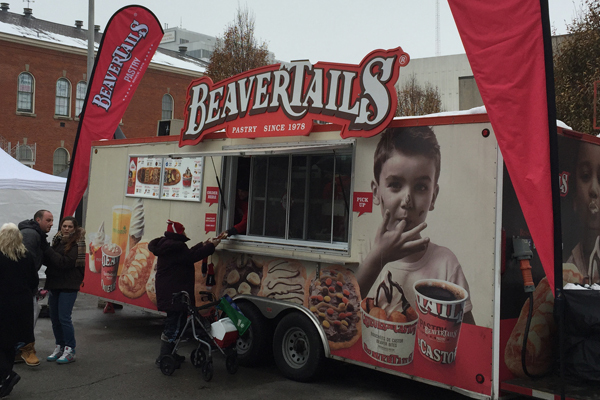 One of Ottawa’s favourite food items, Beavertails, had their food truck there. I remember having Beavertails in Ottawa many years ago. It is awesome that they have now joined the food truck movement! 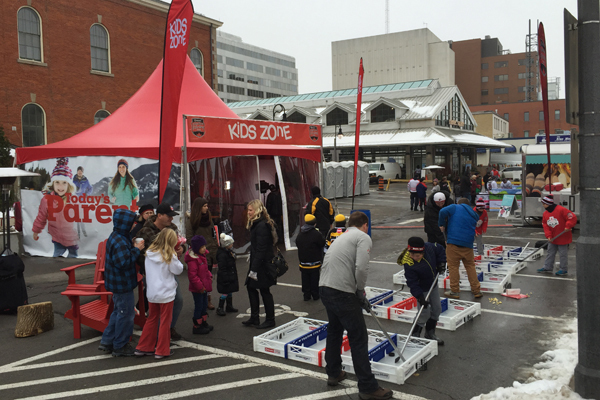 Warming Lodge and the Kid Zone! 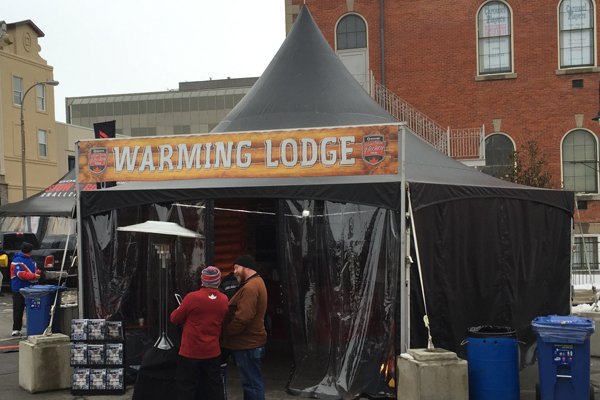 It was a fairly cool weekend, so the Warming Lodge that was set up was a very nice touch! 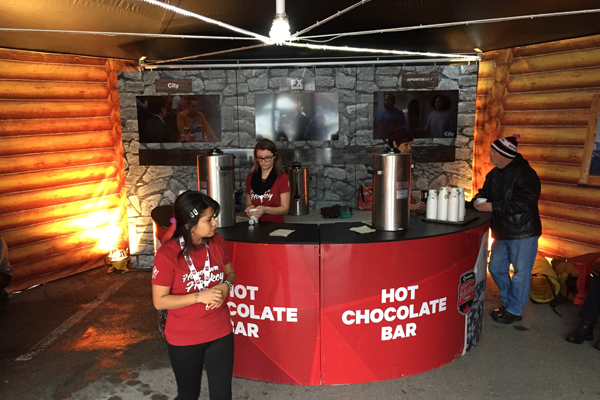 The best part… they were serving hot chocolate, and there was comfy Muskoka Chairs inside to relax in. The Kid Zone was great! There was lots to do for the young ones. Today’s Parent was there with crafts for the kids. 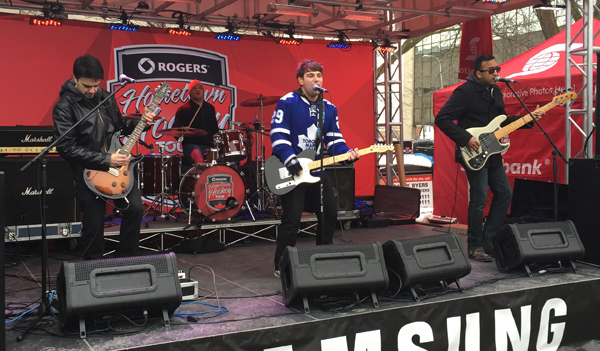 Kitchener band Breaching Vista were just one of the awesome bands Hometown Hockey brought in to entertain the masses. These guys rocked the tunes and had everyone singing along to covers of alt-pop-rock songs. Other bands who provided entertainment were The Hot Karls, Them Dang Rattlers and Poor Young Things. They had a few hockey players lined up, with steps behind them. You could become your favourite player! 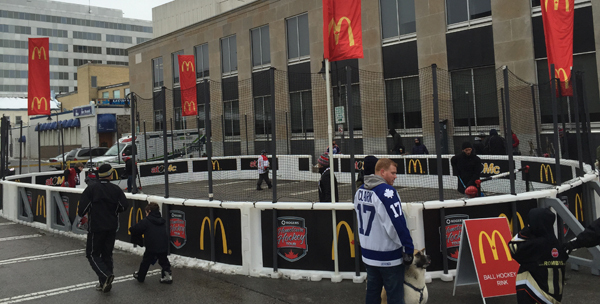 There was even an outdoor rink set up, where you could play pickup with other guests. Shayne was there for a limited time. The lineup was long, but he managed to sign a lot of autographs. Everything was well organized, and ran smoothly. After 45 minutes of signing autographs, Shayne joined Darcy Tucker on stage for a “Hotstove” interview with Tara Slone. Getting autographs and pictures with two of my favourite Maple leafs alumni was clearly the highlight of my weekend! I was invited to a VIP meet and greet with Ron MacLean. There was about 30 of us in total. 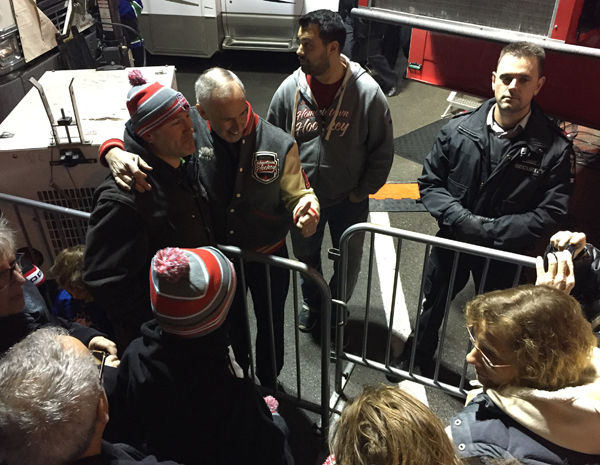 He met with each of us, talked about our hockey memories, and then took pictures with everyone. This picture was taken right before the interview. Ron, Josh and Tara Slone were just talking casually with fans. 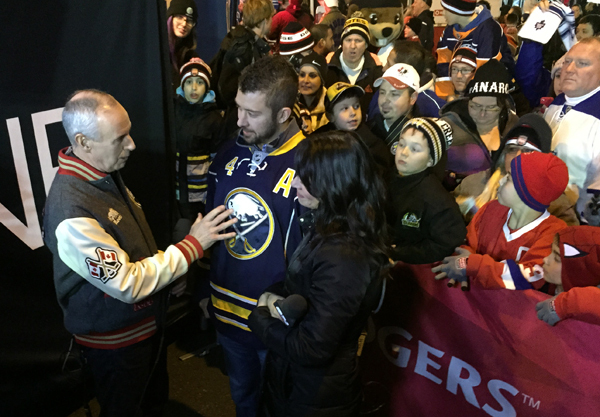 After the interview, Ron stayed outside the Rogers Sportsnet Mobile Studio and signed autographs and took pictures with attendees. Having a VIP pass made this experience even more exciting! Talk about a small world! I met Thomas Weller through my wife. The two of them attended high school together in Niagara Falls. 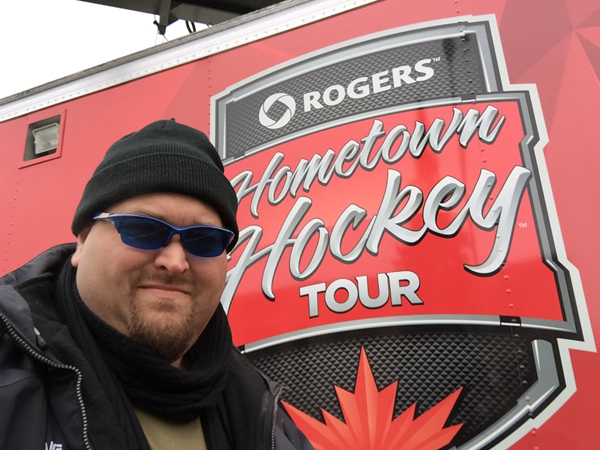 He was the official photographer for the St. Catharines stop of the Rogers Hometown Hockey tour. If you ever need a great photographer in the Niagara region, look no further! You can check out his work at wellerphotography.ca. 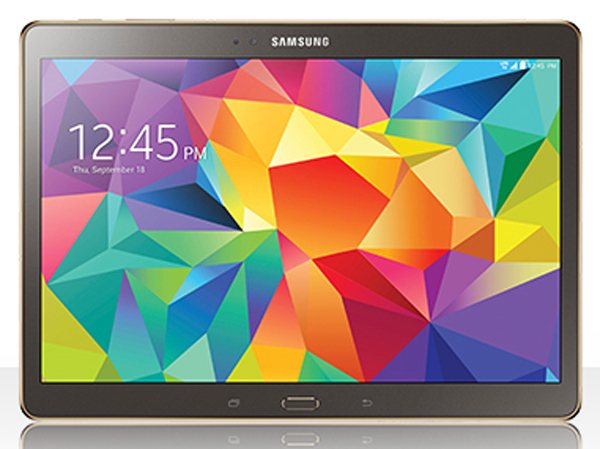 Win a Samsung Galaxy Tab S 10.5″ 16MB from Rogers Hometown Hockey! Remember I teased in my last blog post about something I was going to give away? Tada! 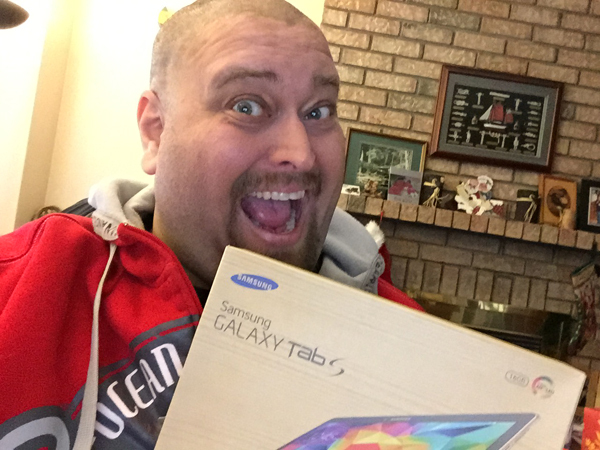 The folks at Rogers have graciously given me a Samsung Galaxy Tab S 10.5″ 16MB tablet to give away to one lucky reader of my blog. All you have to do to enter is click on the Giveaway Tools link below and follow the prompts. Make sure to enter in your first and last name, and your email address. The more things you do, the more entries you will get! Although ti was a super fun weekend, I was really happy when I arrived home, and my girls were waiting for me. They were so excited to see me, and I was excited to give them their jerseys, hats and scarves. Wendy was pretty happy with her signed Darcy Tucker picture. 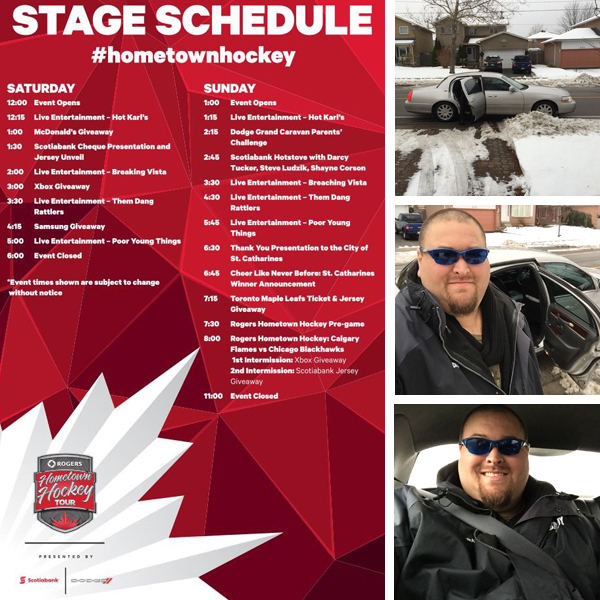 Disclaimer: I am a Rogers Hometown Hockey ambassador. All opinions are my own. Obviously getting autographs with two of your fav Leafs alumni! I mean… that’s kinda a big deal for anyone! This looks like such a cool experience! Getting you picture taken with Darcy Tucker! Meeting Darcy tucker and Shane coroson ! Wow, what an experience, I would say the people you met and the many autographs you received. Getting photos and autographs with your two fav leaf alumni! This event looked awesome Craig!! I’m going to go with getting your pics with Darcy & Shane and their autographs too although it looks like you loved all of it and no wonder! I would say getting autographs and pictures with two of your favourite Maple leafs alumni was clearly the highlight of your weekend! The big riot there was when they threw Rocket Richard out of the game. Taking pictures and getting autographs with Darcy Tucker and Shayne Corson! You took a selfie with Darcy Tucker. Getting autographs and pictures with two of your favourite Maple leafs alumni was clearly the highlight of the weekend! “Getting autographs and pictures with two of my favourite Maple leafs alumni was clearly the highlight of my weekend!” – you loved taking pictures and getting autographs. “Getting autographs and pictures with two of my favourite Maple leafs alumni was clearly the highlight of my weekend! ” Looks like an amazing time!!! You took a selfie with Ron MacLean. When you got your picture with Darcy Tucker. Getting autographs and pictures with your 2 favourite Maple Leafs alumni! Must have been awesome! Ron MacLean , fellow Oakvillian, with whom you had your picture taken! Watching my son, as a youngster, out on the ice, giving hockey his all!! !He’s going to be 22 soon! My fave hockey memory! Selfie taken with Darcy Tucker! Your favorite moment was getting autographs and pictures with two of your favorite Maple leafs alumni . I took a picture with my girlfriend back in highschool with Wendel Clark – she really liked him, he was at our local rec centre for an ice skate. I really liked the selfie with Ron MacLean. Your favourite part was getting your picture taken with Darcy Tucker! Celebrity you took a selfie with was Darcy Tucker. Autographs with two of your favourite Maple Leaf Alumni. My favorite hockey memory was when Pavel Bure played for the Vancouver Canucks. RUSSIAN ROCKET was awesome!! Your favorite moment was getting autographs and pictures with two of your favorite Maple Leafs alumni. Looks like you had a good time !! My fav hockey memory was when I used to sit in front of the TV while my Dad watched the game, sorting my hockey cards. We really bonded over those times talking about which card I had and who was playing etc. got to meet and get my picture taken with Darcy Tucker! He happens to be Wendy’s favourite hockey player. You took a selfie with Darcy Tucker! Wow. Selfie with Darcy Tucker! If getting autographs and pictures with two of your favourite Maple leafs alumni was clearly the highlight, then it must have been your fave moment…I have fond memories of watching TV hockey while my kiddo organized hockey card collection! The best part was Getting autographs and pictures with two of your favourite Maple leafs alumni was clearly the highlight of your weekend! Your selfie with Darcy Tucker! You took a selfie with Ron Maclean! Getting autographs and pictures with two of your favourite Maple leafs alumni! fantastic. You enjoyed a selfie with Darcy Tucker! Getting autographs and pictures with two of your favourite Maple leafs alumni was clearly the highlight of your weekend! My favourite was watching the Canadian Olympic Women’s team win 2014. You loved taking a selfie with Darcy Tucker! Your favourite moment was getting autographs and pictures. getting pics and meeting two maple leafs alumni. My favourite hockey memory is seeing a Stanley Cup finale game at the old Montreal Canadiens Forum. my favorite hockey memory was when vancouver almost won the stanley cup, i was at outside cbc vancouver’s office where they had special seating and a giant tv for the game. i had a lot of excitement even though we didnt win. Family hockey road trips with our son’s team. Took a selfie with Darcy Tucker! My favorite hockey moment was watching my son play sledge hockey for the first time! I loved your selfie with Darcy! Meeting & getting autographs & pictures taken with Darcy Tucker & Shayne Corson, two of your favourite Maple leafs alumni. Selfie with Josh Gorges! Amazing! You got your picture taken with Darcy Tucker! My favourite memory is my grandmother coming to my hockey games when I was a kid. Favourite hockey memory was playing outdoor hockey on our backyard rink in Saskatoon as a kid. Getting autographs and pictures with two of your favourite Maple leafs alumni. Your favourite moment in St. Catherines was when you got to get the autographs and photos with 2 of your fave Maple Leafs Alumni! Your favourite moment was getting autographs and pictures with two of your favourite Maple leafs alumn, Darcy Tucker and Shayne Corson. Selfie was with Darcy Tucker. I remember him when he played in WHL with BLAZERS. One of my favorite memories was the 2011 Vancouver Stanley Cup riot. It was just entertaining in a dark way to watch on TV. And following the media & law enforcement in arresting the guilty persons. Getting autographs and pictures with two of your favourite Maple leafs alumni! My favourite hockey moment was taking my boyfriend to a Leafs game for his birthday. Meet new people and running into old friends. My favourite hockey moment was seeing my sens make the Stanley cup final, yes they lost but I was so proud! The celebrity you took a selfie with was Ron MacLean as I think the hockey players arent really celebraties the same way? Taking my partner to a leafs game for his bday! It was great when Canada won a gold medal in the Olympics. Your fave moment was a selfie with Darcy Tucker! You took a selfie with Darcy Tucker ! Your favourite moment was the selfie with Darcy Tucker. Your selfie with Darcy Tucker was your favorite moment. Favourite hockey memory is playing hockey on our outdoor rink in our backyard as a kid in Saskatoon. You took a selfie with Darcy Tucker! very cool! A selfie with Darcy Tucker. Nicely done! Looks like Meeting and getting autographs with Shane Corson and Darcy Tucker were your highlights! My favourite hockey moment was watching the Toronto Maple Leafs with my father when I was a little girl. Selfie with Darcy Tucker. Fun! Getting autographs and pictures with two favourite Maple Leafs. My favourite hockey moment was watching the canucks in game 7 of the stanley cup a few years ago. a selfie with Darcy Tucker. Seen a distant photo of you taking selfie with Ron MacLean. Favorite hockey memory, when I was growing up I remember playing all of the EA Sports NHL games on different gaming consoles. I still play the titles today. Love it! favourite hockey moment was watching Team Canada win gold in the 2010 at GM Place/Rogers Arena. I live in Vancouver and am a huge hockey fan so that was a dream come true for sure. The Selfie with Darcy Tucker! Getting Autographs and selfies with two of your favorite players! Getting autographs and pictures with two of my favourite Maple leafs alumni was clearly the highlight of your weekend! You took a selfies with Darcy Tucker! I was lucky enough to take in an NHL game. It was absolutely awesome and I truly hope to take in at least one more some day. Your favourite moment was meeting and getting your picture taken with Darcy Tucker. Meeting the Montreal Canadien players outside the Forum. You had a selfie with Darcy Tucker! Your fave moment was taking a selfie with Darcy Tucker. A selfie with Darcy Tucker, so cool! My favourite hockey moment is my son playing hockey for the first time with his cousins! My favourite part is the high level of interaction and the shear joy on everyones faces!! Looks like such a fun event! Getting autographs and pictures with two of your favourite Maple leafs alumni sounds like it was your favourite moment. your favourite moment was getting autographs and taking pictures with 2 of your favourite Leafs alumni. my favourite hockey moment was attending my first NHL game with my dad when I was a kid. I remember loving the atmosphere and then the game too. you took a selfie with Tucker! You took a selfie with Mr. Ron MacLean! My favourite hockey memory was going to my first Toronto Maple Leafs game when I turned 16, at Maple Leaf Gardens! Getting a photo with Darcy Tucker was one of your highlights of your day. Favourite hockey moment was going to my first NHL game with my father. Getting autographs and pics with two of your favourite Leafs alumni was the highlight of your weekend! Getting a photo with Darcy Tucker was one of your highlights of your day Nice!!! You took a selfie with Tucker. Getting your picture taken with Darcy Tucker. My favourite hockey memory is watching hockey with my dad. Taking a selfie with Darcy Tucker! Meet & Greet with Lanny MacDonald & Theoren Fleury from Calgary Flames Alumni last year is my favourite hockey moment. pics with darcy tucker and shayne corson! took a pic with ron mclean! my fav hockey memory is clearing off a pond and shooting the puck around on a farm with just my buddy derek! The best part of your weekend seemed to be when you got autographs and pictures with two of your favourite Maple leafs alumni – what an awesome experience!! Love the pictures! Darcy tucker and Shane Corsica meet and greet with pictures. This looks like it was really well done. Nice job! Wow a selfie with Darcy Tucker i can see how that would be one of your favorite moments. 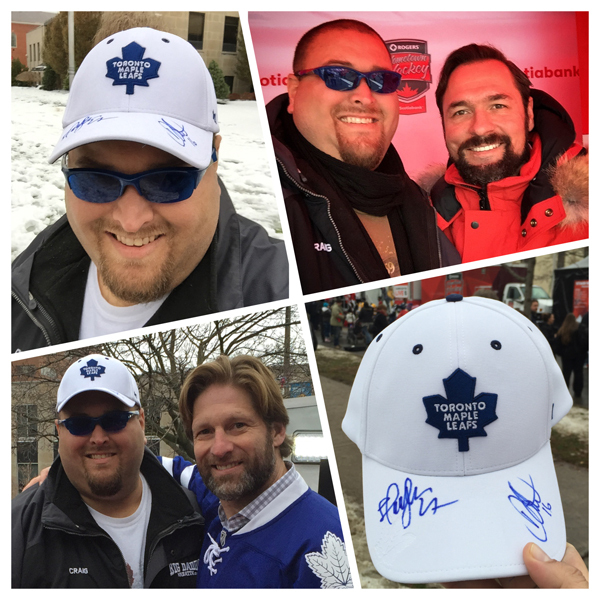 “Getting autographs and pictures with two of my favourite Maple leafs alumni was clearly the highlight of my weekend! Holly wow ….. You had lots of great moments I see but did notice when you said that the Getting autographs and pictures with two of my favourite Maple leafs alumni was clearly the highlight of my weekend. Yap, I hear you. My husband would have been super excited. Taking my son to see the Leafs vs The Red Wings at Copps Coliseum when he was very young. 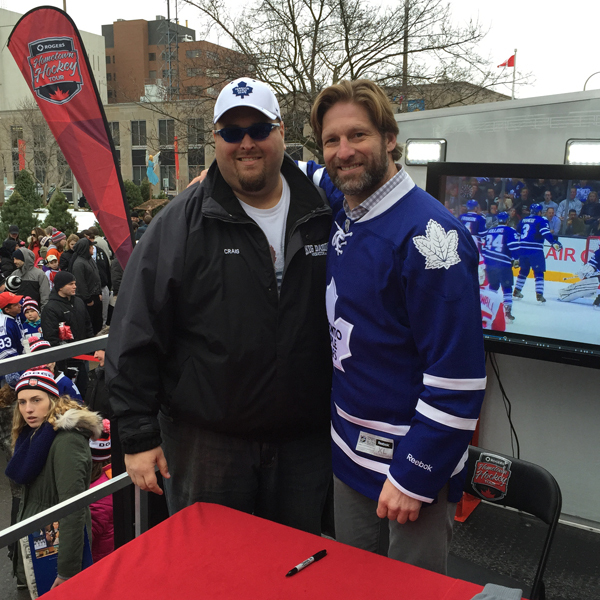 Meeting Shayne Corson and Darcy Tucker. Lucky you! You got to take a selfie with Ron MacLean. My fave hockey moment is watching my son play hockey for the first time with his cousins. Getting autographs and pictures with two of your favourite Maple leafs was your favourite! It looks like you had so much fun! Taking a selfie with Darcy Tucker. Getting autographs and pictures with two of your favourite Maple leafs alumni was the highlight of your weekend! My favourite hockey moments were watching the Flames playoff run in 2004 with my Dad. Fave hockey memory skating with the boys on dad’s homemade hockey rink! Getting pics of the players! Fave memory was going to my first NHL game with my dad. The autographs and pictures with Shayne Corson and Darcy Tucker. Seems so long ago..but the Oilers winning the Stanley cup. Fave hockey memory was my daughters faces when they went to there first game, the London Knights won the ohl, man oh man they were excited. Getting autographs and pictures with two of your favourite Maple leafs alumni was the highlight of your weekend. My favorite hockey memory can’t be narrowed down to one! My father who is no longer with us was a loyal and true Maple Leafs fan..growing up my Dad would never miss a televised game.I can remember coming home and I would see my dad laying on the couch watching the game… and he cheered as if he was there in the arena watching it live!! Every time I see hockey on TV, I’m instantly brought back to the days that Dad would be watching his team play!! 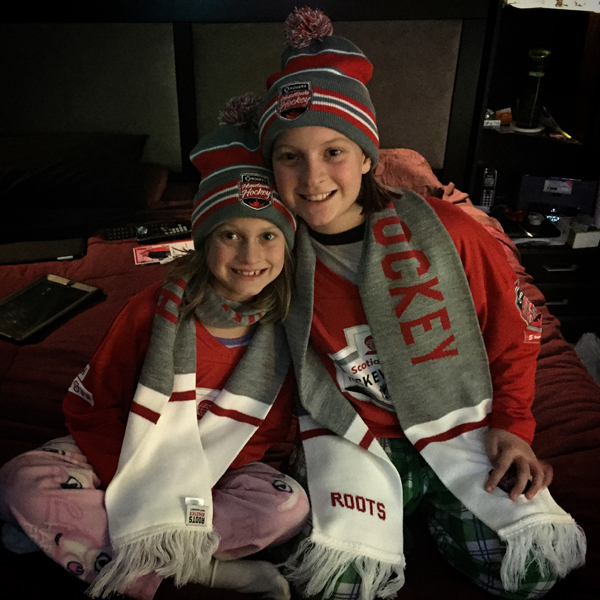 A great hockey memory of mine was watching the Mens and Women Olympic teams win this past year with my daughter. Fave hockey moment was seeing Team Canada win gold in my hometown. Looks like an amazing atmosphere! One of my favorite hockey memories is when I watched my son score his very first goal!! My first hockey game was my favorite hockey memory. It was so exciting with the crowd cheering rather than just me at home on the coach! One of my favorite hockey memories is watching Olympic hockey with my family and cheering on Canada! Highlight was getting pictures and with two of your favourite Toronto Maple Leaf alumi. when the Flames won the cup! Fave moment was seeing Team Canada win gold on home soil. Getting autographs and pictures with two of my favourite Maple leafs alumni was clearly the highlight of my weekend quote from Big Daddy! Your fav moment of the weekend was getting autographs and pictures with Darcy Tucker and Shayne Corson (your fav Leafs alumni). Thanks for the chance at this fab prize! My favourite hockey memory is watching the Buffalo Sabres with my grandpa when I was little. My favourite hometown hockey memory is watching a world junior hockey game with my dad and brother at the old arena. My favourite hockey memory is watching my son get excited to put on his new hockey equipment. This was something I was never able to do so to see him so excited is better than any other memory I have. one of my favourite hockey memories was attending my first Wpg. Jets game. 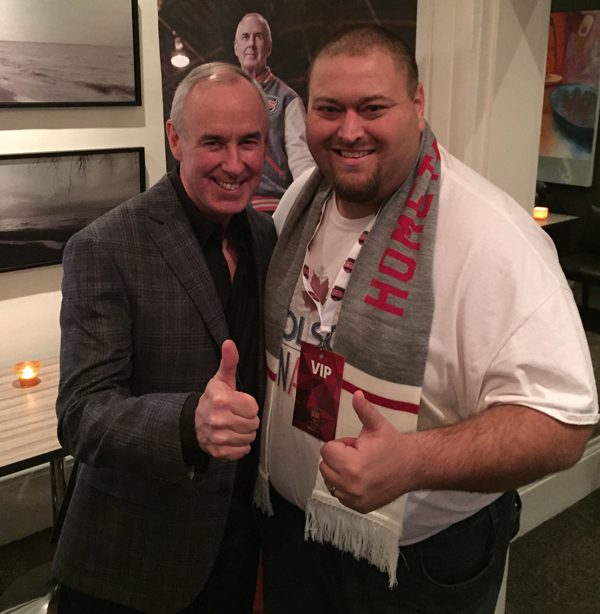 You had a pic – I was invited to a VIP meet and greet with Ron MacLean. My favourite hockey memory, just watching games with the husband. You had your photo taken with the Hockey Home town mascot. Watching it on TV with my parents every Sat night when the players were Bobby Hull, Bobby Orr, Gordie Howe, Tim Horton.Dave Keon. This was the 60’s and it was an exciting and well played game then! You had a photo with the Home town mascot! My fave memory is Sidney Crosby clinching that olympic gold! Getting autographs and pictures with two of your favourite Maple leafs alumni was clearly the highlight of your weekend! A hockey fans dream day!! 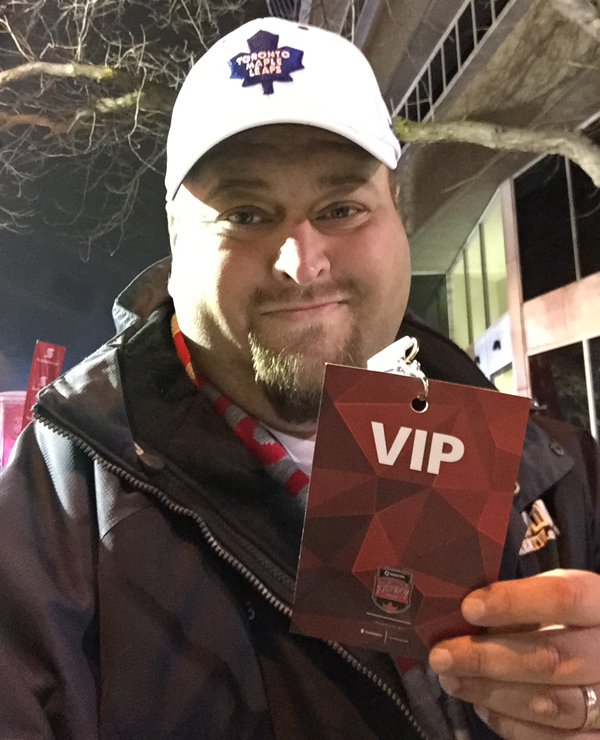 Sadly, I was unable to attend, but my business partner was able to attend the Hometown Hockey event with his son. They loved participating in all the various skills activities that were set up. From what I hear, the Sumu hockey was a big hit. your selfie was with darcy tucker! my favourite memory was attending my first NHL game with my father. You took a selfie with Darcy Tucker. :) Cool ! Fave moment was witnessing Team Canada win GOLD in my own hometown. Fav hockey memory, hearing the stories from when my sister went to the World Juniors. Selfie with Darcy Tucker was your fave part, it would be mine too! Seeing the Flames win the Cup! 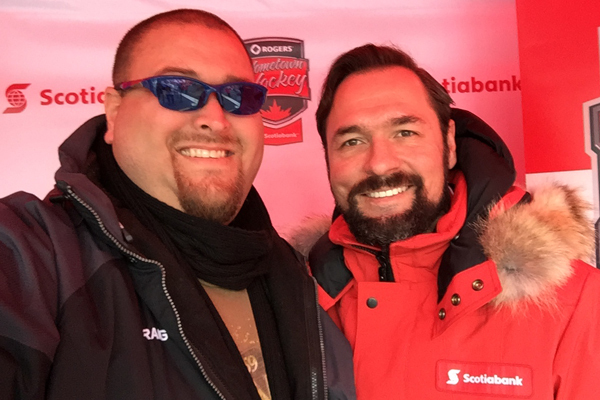 a celebrity you took a selfie with during the Hometown Hockey festivities in St. Catharines was Darcy Tucker! Playing street hockey with Matt Stajan! fave memory was seeing team canada win gold on home soil. Your selfie with Darcy Tucker. Getting autographs and pictures of your favourite Maple Leafs alumni. Neat – Selfie with Tucker. Your pic with Darcy Tucker! My fav memory was watching my first hockey game on TV & seeing Pavel Bure skate & score for the Canucks. you got a selfie with darcy tucker. Love the selfie but the locker room looks sweeeeet! Favorite memory is watching my son play hockey ! Joined for the first time this year! Getting autographs and pictures with two of my favourite Maple leafs alumni was definitely a highlight! getting autographs and pictures with two of your favorite players was a highlight! my favorite hockey momory is watching my younger brother play growing up. One of my favorite hockey memories was when my Unlcle was tying to teach us all to play hockey. He had 10 kids (or more) on the ice ganging up against him. Getting autographs and pictures with your two of your favourite Leafs. Fav memory…watching the parade of former and current Leafs down Yonge St when they moved from MLG to the ACC. Was able to take pictures with many players. 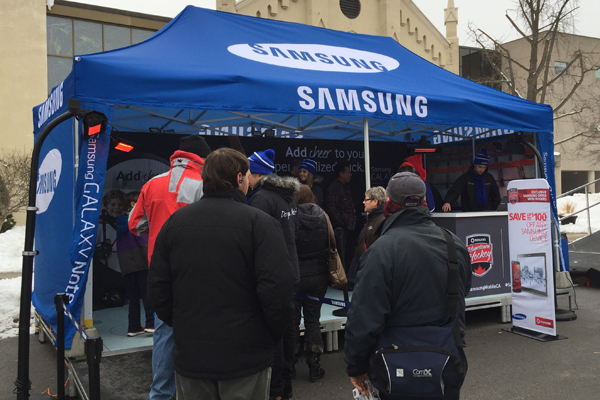 Getting autographs and pictures with two of your favourite Maple leafs alumni was your moment during the Hometown Hockey event in St. Catharines? favourite moment watching Team Canada win Gold in Vancouver. Fav moment – when Team Canada won gold in Vancouver! My favourite memory was when Canada won gold when I was a teenager, we took to the road in the car flying a Canada flag on a hockey stick & got so many honks! One of my favorite ockey memories was when they first built the real rink here in town- it was so exciting and the players shook hands with everyone there because the town built the rink. One highlight was getting the picture with Darcy Tucker. my favourite hockey memory was the first time I ever went to an NHL game. Your favourite moment was getting autographs and pictures with two of your favourite Maple Leafs Alumni. Team Canada winning gold during Vancouver Olympics. The Kids Zone was sweet! I would say it’s a tie between meeting Darcy Tucker, Ron McLean and the BeaverTails truck! You took a selfie with Shane Corson! Meeting your favourite Leafs alumni. My favourite hockey memory is watching my son get his first goal in house league! It’s hard to pick a favourite hockey memory as I have many. When I was a kid I think I was at the rink more than I was at home. I’ve always been a fan but I also loved playing. A fav hockey memory of mine is going to see a game with my future husband. The Maple Leaf Alumni and getting photos taken with them. Getting Gordie Howe’s autograph, the only girl there. My fave hockey moment…is the smell of the rink! Loved stepping into the area! That looks like a terrific event! 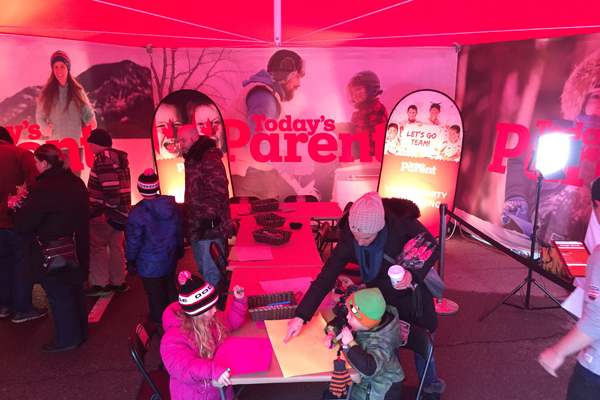 Love the Today’s Parent KidZone. I know I would have loved that. I think our hockey player would have like to have his picture taken as his favourite player. Taking a picture with Darcy Tucker was your favourite moment. Shane corson and Darcy Tucker, meeting them was your favorite. My favourite memory is watching my grandson play his first game. My favorite hockey memory was my first game at Maple Leaf gardens seeing the leafs as a kid. Getting autographs and pictures with your favorite Maple Leaf players! Getting autographs and pictures with 2 of your fave players! I believe other website owners should take this web site as an example, very clean and great user pleasant style.